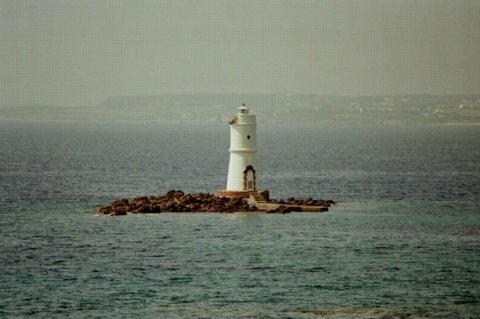 This unique lighthouse is located in the Mediterranean Sea near the coast of Italy. It was built in 1935 on a rock whose Italian name is Mangiabarche meaning in English "Boat Eater", which also gave the name to the lighthouse. It is located between the small islands of San Pietro (St. Peter), near the southwestern coast of Sardinia, Italy and the twin island of Saint Antioco. The lighthouse was built to warn of the nearly invisible shoals in the channel. Standing 36 feet high, the lantern is kept lit by liquid propane gas and gives out a white flash every six seconds with a range of around 7 miles. 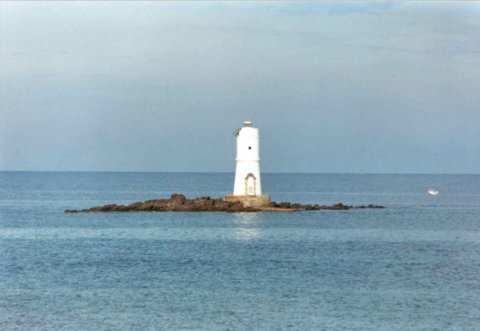 The Lighthouse Service of the Italian Navy maintains the lighthouse. As is evident by the photograph, many of the black and white tiles that cover the tower have disappeared, thanks, in part, to the frequent windstorms and rough seas of the area. See "Info" above for directions. They were copy/pasted directly from the Sardinia Point web page.